Zanzibar Kite Surfing Live Aboard Yacht Safari! Get to the locations! 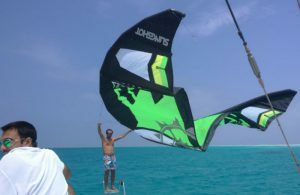 OUR ZANZIBAR KITE SURFING LIVE ABOARD YACHT SAFARI! Enjoy the comfort of a luxurious catamaran! Get away from the crowds and join us onboard for the experience of a lifetime! 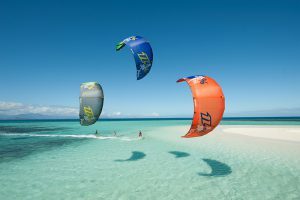 Uniquely our trips follow the wind and take you on an unforgettable journey through the best Kite Surf locations in Zanzibar, Pemba and the East African Coastline. Explore the islands, experience vibrant local cultures and simply enjoy being pampered by our professional crew. 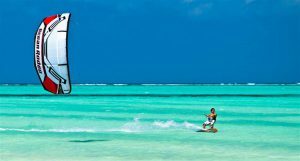 With its constant trade winds, countless islands and tropical climate, Zanzibar, Pemba and the Mafia Island Archipelago seem to have been created for the sole pleasures of sailing and kitesurfing. Needless to say, we organise our navigation plan to combine maximum wind exposure with the most spectacular destinations. 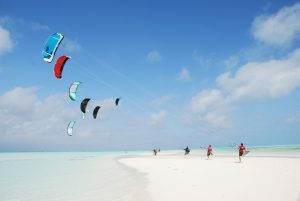 The North Monsoon (Kaskazi) kitesurfing season starts in December and goes through till February. The Kaskazi blows from the north with wind speeds of 12 – 25 knots most days. Average wind speeds you can expect are 15 – 18 knots. During our South Monsoon (Kusi), you can kitesurf from May until October. Occasionally you will get southerly winds blowing as early as April with wind speeds of 12 – 25 knots most days. Average wind speeds you can expect are 15 – 18 knots. On balance the wind is always good and during the kite surf seasons, really reliable. This adventure includes more than just kiting, it’s also about experiencing a new way of life. Wake up inside a turquoise lagoon and start the day with a dip in the water whilst breakfast is prepared by the crew. Furthermore, each day brings a new adventure whether it be discovering a new island, learning a new trick or catching fish for the evening BBQ. Gorgeous locations & good winds! Cruising past Mesali Island in Pemba, Tanzania. You don’t have to be a sailing fanatic to enjoy island hopping on a catamaran. Under sail the yacht is very stable and guests have the freedom to move around the vessel. Sunbathe on the trampoline, relax in the cockpit or try your luck at fishing. Guests are also welcome to participate in sailing the boat. All things considered, by the end of the trip you should be able to lift anchor, hoist the sails and take the helm by yourself. 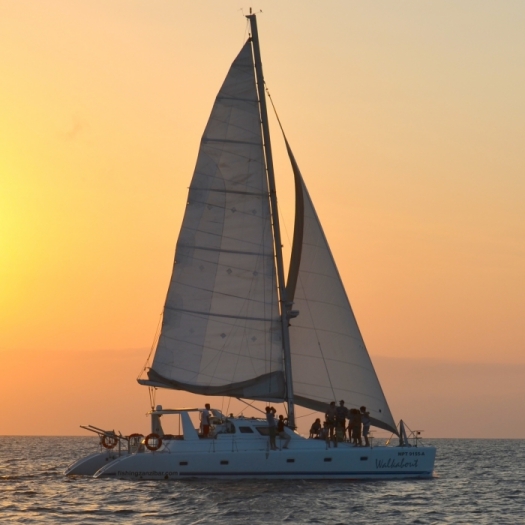 With a modern catamaran you no longer have to be a salty seadog to go on a sailing holiday. Stable, spacious and loaded with creature comforts, you may feel more relaxed than in your own home! 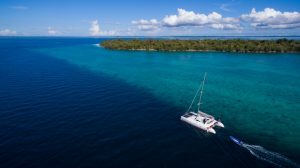 Furthermore, our beautiful 50ft Catamaran “Walkabout” offers accommodation in 4 double cabins, each with queen size bed, fan, sound system and private bathrooms. 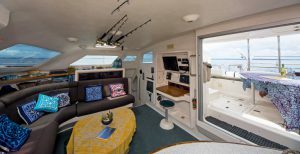 Additionally this catamaran’s layout has been designed to maximize comfort and privacy. The anchorages we visit are all protected from the ocean swells and the beach is usually within comfortable swimming distance. Our crew is always at hand to help you ashore in the auxiliary tender. In any event, it is also often possible to launch your kite directly from the catamaran! On a private yacht you have complete freedom to discover at your own pace the vast multitude of beaches, bays, lagoons and reefs. Spend one night in a harbour with animated beach bars, live music and restaurants and the next day kitesurf on a deserted island away from the crowds. For non kiters there are heaps of other activities available to keep you occupied. See our Activities Menu above to see what’s on offer.